If you are moving residences in San Francisco or the surrounding area, ZippGo can help you from start to finish. 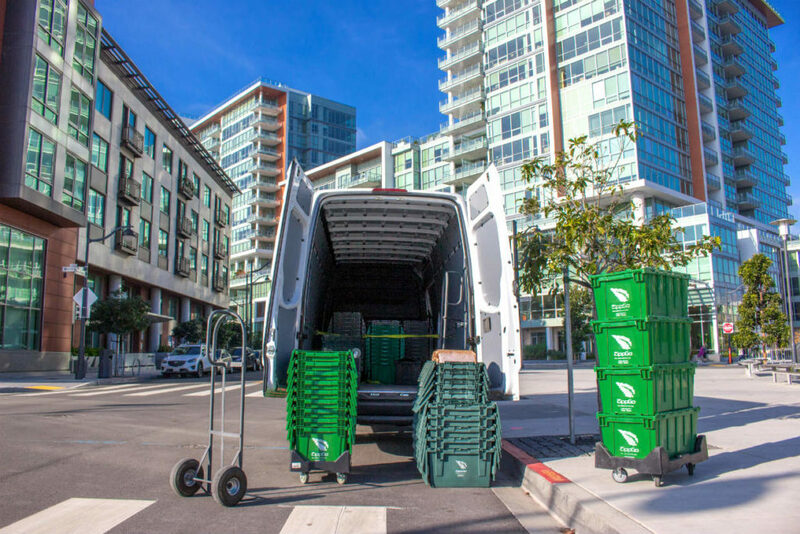 ZippGo rents plastic moving boxes and eco-friendly moving supplies with free delivery in Bay Area cities like San Francisco, Oakland, and San Jose. Since ZippGo is heavily involved in the SF area moving industry, and we understand the characteristics of a good moving company, we have partnered with the best moving professionals that San Francisco has to offer in order to help you find the best mover for your individual needs. There are so many moving company options available in San Francisco that the process of finding a good one can become overwhelming, so in addition to providing you with green moving containers, ZippGo can assist you in untangling the uncertainties of moving companies by finding you a highly rated and credible mover. Thereby, your move becomes efficient and stress-free all the way through. So, after making a reservation for moving containers from ZippGo, simply request a moving company referral for the best moving company option in your particular SF area. That way, all your bases are covered, and your move is smooth from beginning to finish. What is the Criteria for Finding “Best Movers San Francisco”? When ZippGo helps you find a moving professional to get you to your new home in a cost-effective and efficient manner, specific criteria is used to match you with the best moving company option. Since ZippGo’s good reputation and credibility is on the line when providing you with a referral to a moving company, we want to ensure you find the best choice, and loose and unprofessional moving companies definitely won’t make the cut. Let’s discuss some of the things we look for when partnering with a solid moving company in the San Francisco area, and things you should consider as well. Experience is important and a solid record of accomplishment of moving San Francisco residents counts, considering the nuances of a move in the Bay Area. With steeps hills around every corner, confusing traffic rules, and hidden and non-existent parking in some areas, moving homes in San Francisco can be daunting, so it is important to choose a company that has done it successfully many times in the past, so that getting around San Francisco is second nature to them now. Low rates do not always mean you will end up with the lowest final bill. Make sure that you ask about the hourly rate and if there are other charges that could add to the final cost. In other words, make sure there will be no surprises during the final paperwork. Also, deposits are common, so you shouldn’t be surprised if you are asked to pay one to hold your moving date. Ask your movers if they use company employees or use contractors for their labor needs. Company-employed movers are usually better trained and take more precautions with your possessions because their job depends on it. Employees have company pride instilled in them, and the teamwork between the crew is more cohesive and effective. Company trucks and equipment, and company employees are the best ways to go to avoid careless packaging, or lost and damaged possessions. In addition, make sure that the company does a background check on their employees. The moving company you choose should be licensed in your state. In San Francisco and all of California, your moving company is required to have a Cal-T license, which is a six-digit number that should appear on all of the moving company’s documentation and advertising material. The American Moving and Storage Association (AMSA) recommends that you contact the California moving association to check on a moving company’s license as well as other state requirements. The moving company should also be properly insured, so that if any of your possessions break or get lost during the move, the expense can be recovered through an insurance claim. Many part-time movers or Craigslist movers do not have a license or insurance, and therefore, have little or no professional experience. In the State of California, it’s illegal to operate a moving company without a license and the proper insurance. If you are considering hiring a mover, always check on the California Public Utilities Commission website to verify if a moving company is licensed and insured. ZippGo can provide you a moving company referral for a licensed and insured mover. 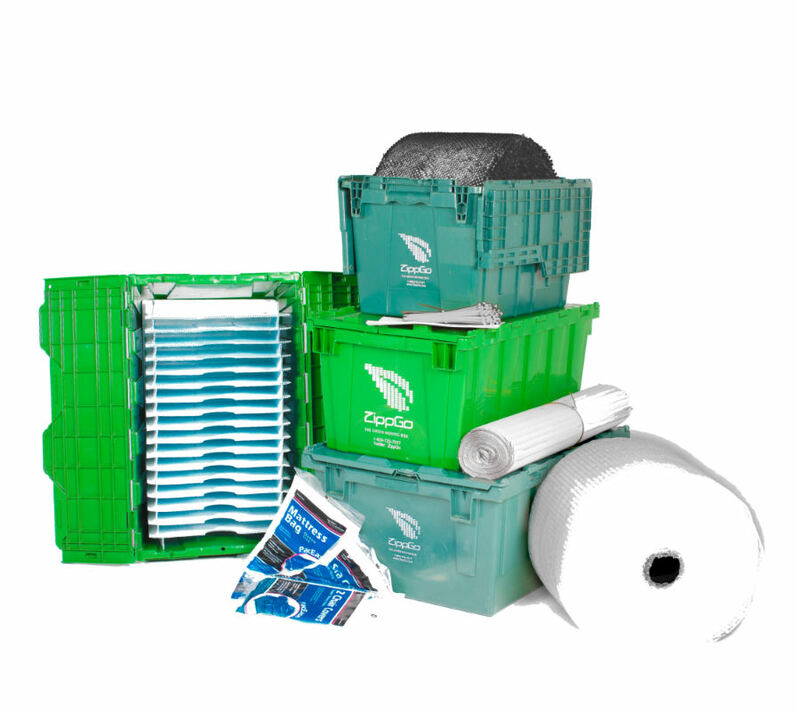 ZippGo provides packing supplies, which can be delivered to you along with your eco-friendly moving containers. ZippGo has wardrobe boxes, and plate and glass dividers, as well as tape, wrap, and paper. If you prefer a professional mover to pack up the belongings at your residence, many moving companies provide this service. They will even unpack the items after they have moved your home, if that is what you require. After you place your container and moving supply order, ask ZippGo to find you a mover who can pack your house. Also, if you have special packing and handling requirements, make sure you discuss the matter ahead of time with the mover. Specialty items might include artwork, antique furniture, safes, pool tables, and pianos. It is imperative to do research before choosing a moving company. Don’t just go with the lowest priced service. Check websites like Yelp, Google, Citysearch, and TrustLink to find the best moving companies in San Francisco. In addition, you can check the moving company’s social media pages and read the comments from their customers. Also, check the San Francisco Better Business Bureau website to ensure they have an “A” rating or above. ZippGo can help you find highly-rated moving companies. Every company has a few difficult clients who are impossible to please, and oftentimes, competing companies will “anonymously” write bad reviews or comments, so look at the overall experience of the mover’s customers, and toss out any reviews that seem generic or do not have an identity attached to them. Let ZippGo help you ease the anxiety of your moving experience by bringing moving containers and packing supplies to your door, and providing you with a moving company referral that you know you can trust. Do I Really Need to Hire a Moving Company or Can I do it Myself? Your moving budget is the first thing you must consider before deciding to hire a mover. Calculate the maximum amount you can spend on the move before you proceed to find a professional moving company. Moving your possessions will be the biggest expense, but other expenses can be costly as well, so give yourself a solid estimate after considering all of the costs involved. “Do-it-yourself” moves rarely end up being a cost-effective solution when you consider all that is involved. First, renting a moving truck is not as inexpensive as you might think. A 20-foot and 26-foot gas-guzzling moving truck gets nine miles on a gallon of gas, and the current U-Haul rental rate for an in-city move, using trucks of this size, is $39.95 plus $1.89 per mile. If you go 20 miles, you add an extra $37.90 to the final cost. Also, a two-person crew to assist you with moving your boxes and furniture for four hours will cost $250-$350 on each end of your move, and you never know if the people you hire have any prior moving experience. It is critical that you do research according to your specific needs and travel distance from your old to new residence, and calculate the total cost of a DIY move. Then, when you receive an estimated moving fee, you’ll have an idea of what is the cost of hiring a moving company, in order to determine if doing it yourself is really worth the time and effort. Also, keep in mind that moving crews are experts; they move people every day, and they are quick and efficient, and reduce the chance of damage.